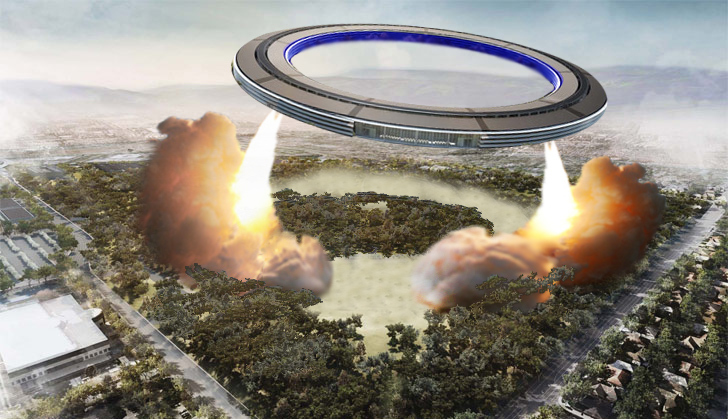 Apple has caught some heat for its controversial, car-dependent Cupertino campus proposal, but an anonymous tipster has leaked an updated rendering to Inhabitat that would way up the controversy on the much-hyped, circular Apple campus. It looks as though the wild speculation about the campus’ spaceship-esque shape may not have been as out there as we thought, since it appears that someone over at Apple (possibly Steve Jobs?) was envisioning the new flying-saucer shaped campus as a massive airship. While we have little to go on other than this image, it appears that the campus is being designed as a high-tech intergalactic spaceship! It begs the question: What does Apple know that we don’t? Noting the lack of interest customers have expressed in Apple’s iCloud storage system, our tipster suggests that in a unprecedented marketing gesture Apple would use the airship to physically demonstrate the iCloud’s usefulness. Others have speculated that new Apple boss Tim Cook might plan to use the spacecraft to prevent new Apple products, like the iPhone and iPad, from being leaked before release date. By removing the campus from Silicon Valley and shuttling all of its workers away from Earth during the weeks and months leading up to a new iPhone release, for example, Cook might hope to keep the notoriously secretive company’s new designs away from the prying eyes and ears of tech bloggers. Our anonymous tipster believes that the architects behind the campus from Foster + Partners have been working with Geotectura to design the craft, which could be powered partially by PV panels and use the same kind of advanced propulsion system as zeppelins like the Aeros Pelican. If you look closely where the smoke is, the trees have a sharp and defined edge. While on the inner edges of the spacecraft it is blurry and meets a sharp edge as well. Whoever made the image needs to do go through some tutorials on how to use photoshop. Apple has caught some heat for its controversial, car-dependent Cupertino campus proposal, but an anonymous tipster has leaked an updated rendering to Inhabitat that would way up the controversy on the much-hyped, circular Apple campus. It looks as though the wild speculation about the campus' spaceship-esque shape may not have been as out there as we thought, since it appears that someone over at Apple (possibly Steve Jobs?) was envisioning the new flying-saucer shaped campus as a massive airship. While we have little to go on other than this image, it appears that the campus is being designed as a high-tech intergalactic spaceship! It begs the question: What does Apple know that we don't?